Ramblings of an Opinionated Bong...: Is Isco good enough to replace Ozil and Kaka at Real Madrid? 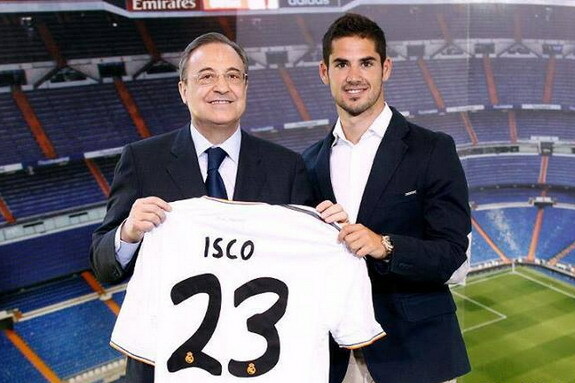 Is Isco good enough to replace Ozil and Kaka at Real Madrid? In my last post, I talked about the new evolution that is happening at Real Madrid, with them entrusting up-and-coming Spanish youngsters at the expense of Galacticos like Mesut Ozil, Kaka and Gonzalo Higuain to carry them ahead in the near future, signing the likes of Isco, Aiser Illarramendi and Dani Carvajal, and promoting Nacho, Alvaro Morata and Jese Rodriguez to the first team. I have talked about why I think Asier Illarramendi will be crucial to Real Madrid's success in the near future, and its time to look at another of their potential superstars in the making. From the moment Real Madrid confirmed the signing of Francisco Roman Alarcon 'Isco' from Malaga in a deal worth a reported €27 million plus €3 million in add-ons, there were talks of how he would fit into the team with Mesut Ozil occupying his favored role as the advanced playmaker in the side, with Kaka waiting in the wings to come in. A lot of pundits expected a new lease of like for Kaka under Carlo Ancelotti, with the Italian expected to bring the best out of the Brazilian, akin to his glory days in Milan. However, now that the transfer window is over, and Ancelotti has settled on his first team, the likes of Ozil and Kaka are nowhere to be seen in the Spanish capital, with the Italian choosing to depend on the diminutive Spaniard. Lets face it, Mesut Ozil was an important player for the Blancos, but considering the immense outlay on the arrival of Gareth Bale from Tottenham, the German had to be moved on. While it wasn't a popular decision by any means - the fans that had come along to the Santiago Bernabeu to welcome new signing Gareth Bale on Monday screamed "Don't sell Ozil"- it was a move that was always likely to take place. Goal.com's Spanish football expert Ben Hayward explained why Real Madrid had to sell Mesut Ozil, stating that the popular playmaker never looked likely to be first choice under Ancelotti. Madrid had long looked to remove Kaka from their wage bill and the Brazilian moved on for free to former team AC Milan on Monday. With the club still looking to recoup extra funds Ozil ended up leaving too. Apart from the chances created, Ozil is at par with most the other two, Kaka and Isco as far as the performance of last season in the league are concerned. What sets Isco apart from the other two is that the former Malaga man is more of an all-round player; more athletic, quicker, stronger and able to operate in a number of different positions, boasting brilliant vision and tremendous technique. Crucially, he scores goals as well. So far, he has hit three already in just three games and also set up one of Madrid's other three strikes in 2013-14. Isco can be Real Madrid's second best dribbler already, and that's something the team needs desperately. Cristiano Ronaldo is not that kind of a player anymore and Di María seems to choose wrong everytime, so it will be very interesting to have a player capable of dribbling two or three opponents in the same play. That's a good way of breaking down tight defensive lines that Real Madrid was lacking this past season. At 21, Isco is nowhere near his peak. Whether he can go to form such a successful association with Ronaldo remains to be seen (Ozil set up 27 goals for Cristiano in three seasons), but all of the talent is there for him to become an ever better player than the German. Isco will be a cornerstone of this next Real side being built, possibly in several roles, but very much with one eye on becoming the next leader of the Madrid side searching to recapture La Liga and finally end the long, long wait for the decima—the Holy Grail—the 10th Champions League title. Expect the brightest of the futures out of this young player. All he has to do is live up to his potential.